Get the Ultimate in Security and Convenience with our patent pending PatioLockTM dog door for sliding door system which can lock your glass door without screwing, drilling or cutting! You can also use your screen door without any cutting or handy skills if you also buy our patented Adjustable Screen Door Adapter. Fully adjustable so multiple use for if/when you move home! What Patent Pending products do we have that separates us from the rest? 1. 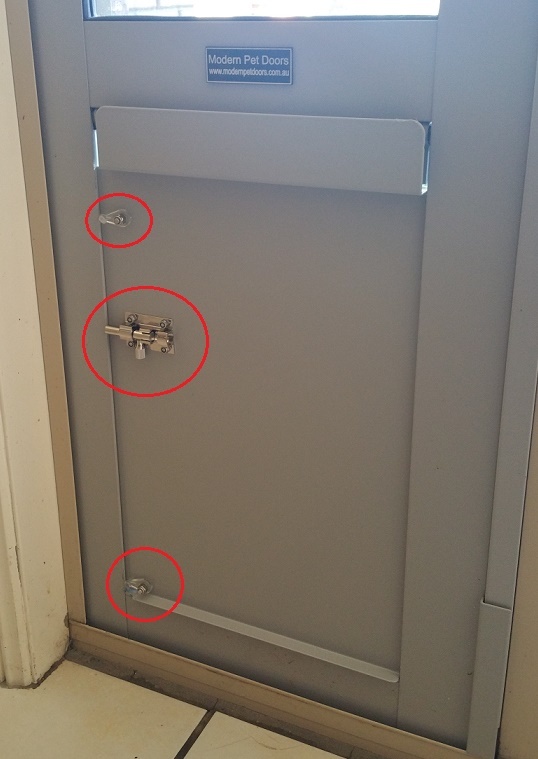 PatioLockTM kits = Glass door locks with NO SCREWING OR DRILLING! 2. Adjustable Screen Door Adapter = Use screen door + Max Security with NO CUTTING! Fortunately, the choice is pretty easy. Most Popular & Convenient Choice: The PatioLockTM system which includes an adjustable screen door adapter and lock kit to suit your existing sliding door lock is the best way to go for most. It is cheaper overall; there are no additional handyman costs; it can be reused if/when you move; it has been designed to be installed by people who are NOT at all handy :); easy to install and remove (e.g., holidays, entertaining) and you won't leave screw holes everywhere. So great for renters and/or people who are not handy but want security! For the Home Owner AND Handy-skilled / Tinkerer: If you are a home owner & handy skilled & have 3 hours spare & are not moving home & are happy to leave holes in the pet door and sliding door frame, then you could buy the Pet door with a screen door adapter and transfer locks onto the pet door system. This involves skills, tools, screwing etc. Budget: If you just want a pet door for a laundry and/or are on a tight budget, then you could just buy the pet door on its own. There is a rod in the pet door box that can be cut and put in the floor track to crudely but effectively wedge the glass door against the pet door. What Size flaps are there? Click here for a link to flap sizes. Can I lock the flap? Yes, you can see the steel powder coated lock panel and lock system in the picture below. Pick one Adjustable Screen Door Adapter +$80. No Cutting! Multi-use! Easy Instal. No Handy Skills. No thanks- I don't want to maximise security nor use my screen door. Works well looks good.Dog loves it.Thankyou. We just received the patio door with the screen door kit and I have to say, I am very impressed with both the build quality of the equipment and the ease of installation. A lot of work has clearly gone into the design and it certainly shows. Easy to install, secure, keeps bugs out. Half the price of other options. Fast delivery. Thank you modern pet doors! So Easy to install, Customer Support is Brilliant! As renters, we have struggled with access for our puppies, and thinking of buying new doors to attach, and replace once we leave. But not being handy people, we kept putting it off. So glad we did. I found Modern Pet Doors & our life was changed, ordered the Patio Lock system immediately after a quick call to check what size they would recommend. We received our packages in QLD within 2 business days of shipping from SA! The instructions were perfectly clear, and we installed it easily & without drama. We did have 1 issue with our locks not aligning (due to dodgy house, not the product), but after a quick text with images to Julian, he replied promptly with a solution that worked perfectly! Our 2 dogs had some hesitation to begin with, but lots of treats on each side & they now love the freedom they have to come in & out. Our only problem now is the many 'gifts' our dogs are bringing us! If you are wondering if this is the right solution - don't. It is! I definitely 100% recommend this product for anyone with sliding doors. Great work guys! Perfect for defence families who move every few years. Simple to install. Quality product and I’d highly recommend modern pet doors. We are really happy with the pet door. The service was prompt, it arrived in a couple of days and was installed easily. Great to have a choice of colours - blends perfectly with our doors and windows. It’s good quality, sturdy, and a great fit, and locks securely. Highly recommend!